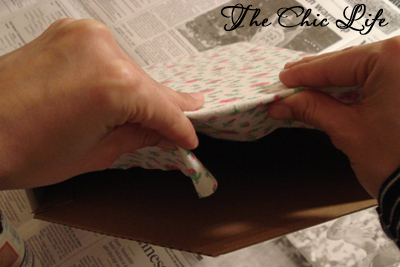 To start, I google-searched for handmade, re-usable, fabric grocery bag/tote tutorials. 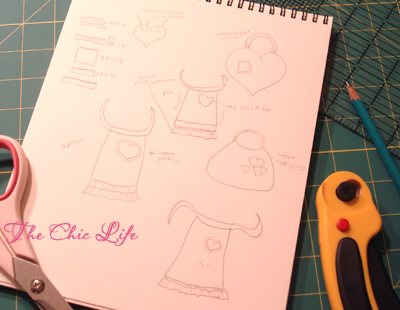 There were tons of tutorials, but I decided this one, by Homemaking Dreams (thanks for sharing, HD! ), one was the best and looked super easy to put together. I also liked that the tutorial didn't use a pattern...you just had to cut a bunch of rectangles up. Next, I had a hard time choosing which fabrics to use. I have a bad habit of hoarding away my faves (of anything - fabric, beads, foods, etc. ), but I decided that since I'm going to be using these bags quite often, I may as well use a fabric that I absolutely love so I can enjoy using my totes even more. 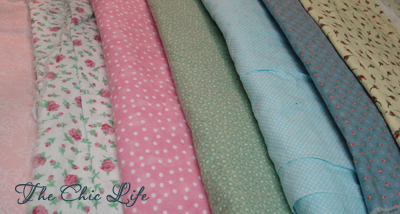 I picked one of my fave fabrics (the turquoise-y one above) that I've been hoarding for a couple years now. My next tough call was choosing the lining fabric, which could actually be an outside fabric, too, since the tote is reversible. I wanted to use the green because it coordinated with the specks of green on the main fabric and would hide dirt better, but I thought the pink was a much better match color-wise, so I went with the pink. After choosing the fabric, I got my work area ready. My computer currently resides on our dining room table, and I decided that instead of printing out the tutorial, I'd leave it up on my computer, turn the screen so I could see it from the sewing machine, and save some trees in the process. I also got a candle going to keep the mood relaxed. The fabric cutting seemed to take forever! Luckily, I had already pre-washed these fabrics, but they were all wrinkly because I neglected to iron them beforehand. So, I had to mix my cutting up with some ironing to get them in the proper size. I had a handful of these little 2 1/2" square leftover, so I think I'm going to keep these for another project...possibly a quilt!? I had my computer screen positioned nicely so I could look up and double-check my work at any time. The scrolling was more challenging since I left my mouse further away, but I still really enjoyed working from my screen vs a paper print-out of the tutorial. 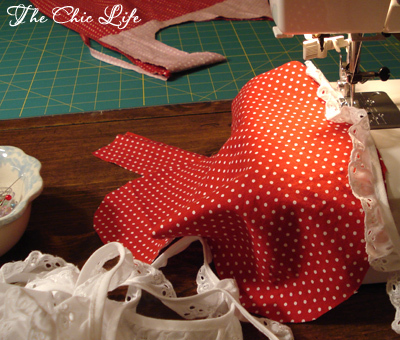 Sewing the pieces together was a cinch - just a bunch of straight sewing! I had a nice phone conversation with my dad while I was working on this part of the tutorial. We talked for a long time about why/how he got into being green and eating organic foods. He even talked about how he ate organic foods "back in the day" before I was born and how he was part of some organic food organization in Atlanta, I think it's this one - Sevanada. I didn't even know organic food existed then! He went on (the man likes to talk!) to talk about subscribing to organic gardening magazines, keeping his compost pile, researching solar power for school, natural foods, taking my sister and me to local farms to pick vegetables so he could teach me when they were ripe and feed us natural foods, and even how he almost built our family a sustainable house with a mud roof and south-facing window for passive solar design! Sounds like I'm first generation organic...just like Sara Snow! How cool!? Oh, and I'm trying to talk my dad into starting a blog...hehe. He has lots of great advice that I think could really benefit other people. Plus, like I said, the man likes to talk! If he could blog as much as he talks, I think he could have a good thing going! After I got the handles sewn up, I had to pin them in place. I did this part veeeeeeeery carefully. I'd done too much work to mess up now! Overall, this tutorial rocked! I have fabric cut already to make a second bag and am thinking of making another one that is slightly larger than the first 2. The tutorial was very simple to follow and had tons of photos that were very helpful (I'm a very visual person). This project would make an excellent sewing project for begginner sewers and would be super simple for those more experienced. I highly recommend trying it out and if you do, let me know! I'd love to see your finished work! Since I had Monday off and had planned to spend Saturday out of town, I met up with bloggie buddy, April, and her daughter, Bella, Monday afternoon for some crafty shopping and a delicious lunch. First, we hit up a fabric store where I was really good! I latched onto a bolt of this yummy floral pattern with bright pinks, turquoises, greens, and yellows that were all toned down by a pastel pink background. I carried the bolt around the store for about 15 minutes before finally caving into the realization that I was, indeed, going to buy some (been trying to not buy craft supplies lately). I also picked up 10 fat quarters of some super pretty vintage-y fabric that I think will work well with the fabrics I'm collecting for my quilt! After lunch, we hit up ABC (Atlanta Bread Company) for some hot cocoa. Bella was working on a hand-knit scarf. I totally forgot about how I used to do this all the time when I was a kid! I think the colors look great with her sweater and shirt. April and I browsed her new collections of magazines - the new Knit Simple and a Quilting magazine with "lots of easy project". We noted that these "relaxing" projects were far from what we would consider relaxing, but I've only ever made one quilt, so maybe they are marketing this towards die-hard quilt fanatics? April worked on a baby hat for a friend and I worked on my scarf for my mom's b-day. We got a lot of good work done and had a blast in the process! Thanks, April, for the fun day! Let's do that again some time soon! Yellow fabrics from my stash. A thrifted mug with a yellow flower and a butter-yellow candle from a previous vacation. Some jeweled, yellow faux hydrageas (along with some other colors). I love crafting with these! One of my favorite mugs that I got from Starbucks (on sale, too!) with a yellow inside and little yellow flowers. And, finally, some real yellow flowers - a gift from my hubby. Thanks Caroline for all the colorful fun! I took yesterday off from work to finish up some Christmas gifts and bake something for today's Christmas dinner with the fam. My day-off felt more like a day at work, except, this time, I was working in Santa's Workshop...lol. I had another pair of those oven mitts to make. This time, I decided to use pre-quilted fabric to save some time. I decided to make another change to the way these were sewn from the way the pattern instructed. Last time I made these, I found sewing the bottom hem as the last step (with the mitt sides already sewn together) extremely frustrating because it's hard to sew in a circle when the circle is so small. This time, after sewing the ric-rac onto the mitt halves, I sewed the bottom hem a 1/4 inch and then sewed the two oven halves together. 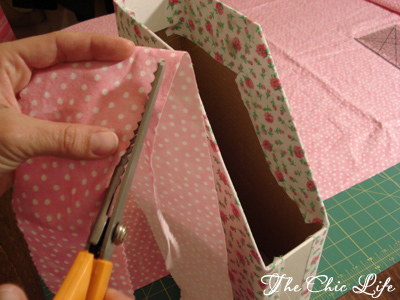 I liked this method better since it was easier on my newbie-sewing-skills. I also had time to draw and make some little hang tags. I just love doodling, don't you? The tags helped finish the oven mitt presentation so I just needed to add some tissue paper, a gift box, and some wrapping paper. I also made a quick hang tag for that scarf, which I finished over Thanksgiving. Anywho, we just finished unwrapping presents and having Christmas brunch, so I'm off to take a much-needed relaxation break. I think I'll work on some of my other knitting WIP's or something. Ahhh...finally...a day off! I've moved on to my second project (as in the one after the first - click) from a Sew Simple I got some time late last year - a fleece blanket. The project looked like one of the easiest in the magazine. Simply cut a rectangle of polar fleece to the size you want (I think I did a yard and half), sew two pieces of satin binding together, then apply the binding to the fleece...voila! 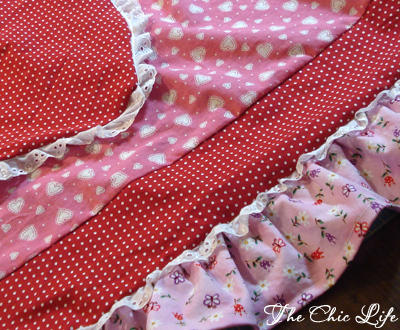 I learned pretty quickly that my project was not sew-simple afterall...at least not for my newbie-sewing-skills. For one thing, the polar fleece was a slippery thing, indeed! I couldn't quite get the edge of the fleece exactly to the fold of the binding. Every time I'd slide the fleece in, it would wiggle itself out ever.so.slightly. Secondly, the binding was difficult to press. I melted the first edge of binding trying to press the edge down 1/4 inch. Luckily, I only burned off an inch and was able to cut away a new edge. I turned the heat down, but the lower heat didn't help the pressed folds stay-put. But, the most aggravating thing about this project was how the binding slipped while you were sewing. You should just see the first edge I did. It's terrible. I think 1/4 inch of the binding slipping along the way towards the back, leaving the edge oddly shaped and slightly twisted. And the mitered edge after that...wow...it's really bad. Quite embarrassing, actually. I plugged along, though, and learned a lot of lessons along the way. Although the one edge is pretty off-kilter, I think the fleece blanket turned out pretty good for only my second time (click for first) applying binding. Besides, this is a present for a small boy...he'll probably tear this up in no time anyways, right? :) Hopefully, he'll get lots of good use out of it before then. Did you know that there are only about forty days left till Christmas? Yikes! Just when you think you are starting your handmade Christmas projects early, you find out you are behind! I'm not sure if I'm going to finish that afghan in time, seeing as how it takes three to four hours to make one square, and I'm supposed to make at least, roughly, forty squares for an afghan. Yea...that means I'd need to make an average of one square a day. My stats are not looking good...lol. But, that's ok...if I don't finish it, I will come up with something else. I'm not sweating it. In the meantime, I still have a few other handmade presents I'd like to finish before December 25th. Something tells me my weekends are going to get a lot more crafty...and I'm A-Ok with that! Yesterday was my run-errands, clean-up-the-house, and bake-cupcakes day. With my home newly cleaned and errands out of the way, I was free to let my creative juices run. 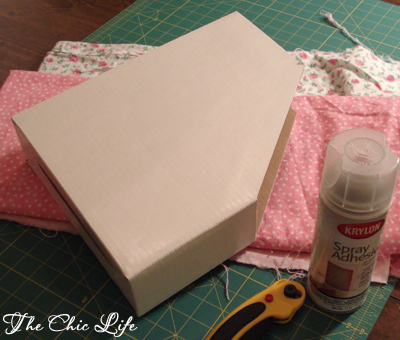 I decided to work on a project I really liked from a Sew Simple magazine I got some time last year. 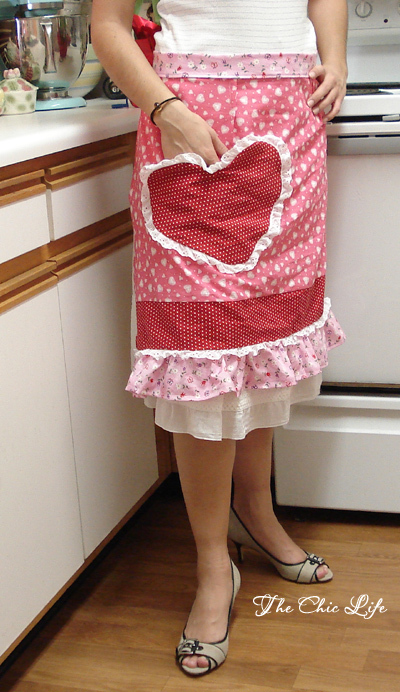 The project was for handmade, quilted oven mitts. I laid out all my materials before realizing that I needed some blue ric-rac to properly decorate the mitts. Even though I had a minor set-back, I decided to enjoy a quick trip out of the house to pick up the materials I needed from Hancock Fabrics. I also picked up a couple other things while I was at HF for some other gift ideas I've been working on. When I got back from Hancock Fabrics, it was (late) lunchtime, so I decided to make a quick egg-drop soup. I had the soup with some cherry tomatoes (leftover from the other night's swordfish dinner) and water, while browsing some other crafty magazines for gift ideas. I also had some hot, peppermint tea and a cupcake...yummy! After lunch, it was back to business. I decided to make two oven mitts, so I doubled the materials, cut fabric, and machine-quilted some rectangles. The mitts came out less than perfect, but that's what makes something handmade-special. Right? :) I'm still fairly new to sewing, so I'm very happy with the results. I did make one pretty big error - do you see it? I sewed the loops for the mitts on opposite sides...oopsie! Guess I'll be fixing that later tonight. Either way, I had fun, learned some new lessons, and I now have one Christmas present (almost) ready. I'm off to have a cupcake and work on some crochet while watching one of my fave shows - Cold Case! I got these simple, white magazine holders awhile back from a local organization supplies store. I knew I'd be able to do something cool with them...I just wasn't quite sure what. 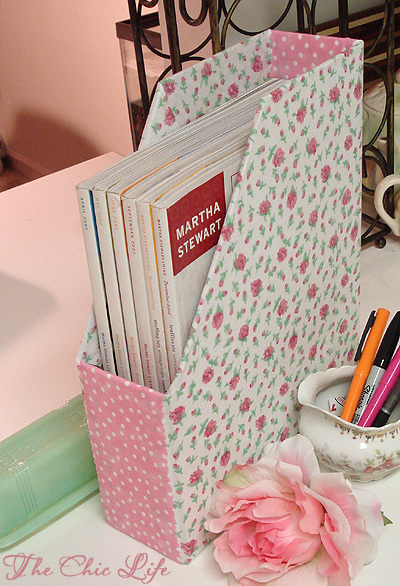 I've been seeing lots of craft projects involving spray adhesive and figured since I already had some that I'd give it a go and give my magazine holders a makeover with some pretty fabric from my stash. I gathered my materials and selected a couple fabrics. The magazine holder came partially pre-assembled so I couldn't easily make a template as it wouldn't lie completely flat (and I didn't feel up to taking it apart and re-gluing it later...lazy me, I know). I figured I'd "cheat" and just do two colors - one on each side and and another corresponding color around the narrow edges. 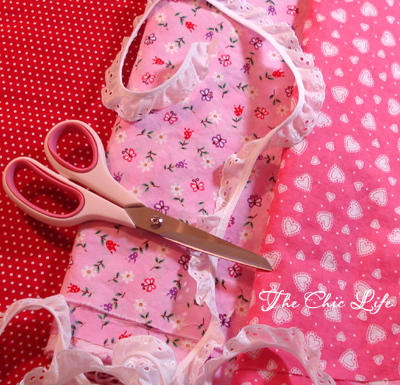 I started by cutting my fabric pieces and giving them a quick ironing as they had been pre-washed and were a bit wrinkly. Then, I laid newspaper over my dining room table and sprayed one side of the magazine holder with the glue. I let it dry for approximately one minute (per the bottle) and carefully applied the first side, gently spreading the fabric to help keep it nice and smooth. As I didn't want the inside of the magazine holder to be sticky and this spray adhesive is a bit hard to control without covering stuff up, etc., I decided to use my friend, hot glue, to tack down the sides and stick the fabric down on the inside. 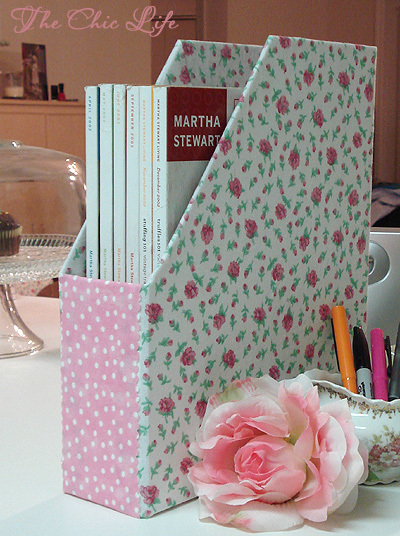 I repeated the previous steps for the other side of the magazine holder. Then, I took a long piece of fabric just a tad wider than the narrow width of the magazine holder and trimmed the sides with my scallop-edge pinking shears to give it a decorative edge as I wasn't sure I could hide the raw edges. I figured if they were going to show, they might as well be cute, right? Anywho, b/c I was feeling a tad lazy, I decided just to use hot glue to glue down the long piece along the narrow edge of the magazine holder. The spray adhesive is rather messy and gets everything sticky if you're not careful, and I didn't want to be bothered with the newspaper sticking to me and stuff. What do you think about the finished product? I have soooo very many magazines, I think I could possibly spend a lifetime making these little holders to contain all of them, but alas...I do not have such free time. Maybe I'll make one here and there?